Computer data storage can be classified into volatile and non-volatile storage. Volatile memories like dynamic random access memories (DRAMs) are short-term memories with a high writing speed, but they require an external power source for data storage – whereas non-volatile flash memories do not need an external power source and are able to store data for years, but they write information about 1000 times slower than Drams. Our novel semiconductor nanostructure based memory cell combines the advantages of the non-volatility of flash memories with the performance and the endurance of a DRAM. The memory comprises a strained double heterostructure, has an inner semiconductor layer comprising quantum dots and is sandwiched by two outer semiconductor layers. 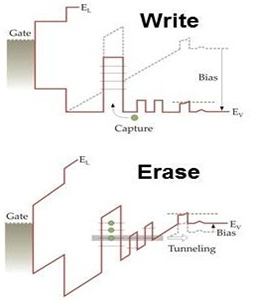 The memory cell uses holes as charge carriers.